That snoring may be doing more than keeping you up at night; it may be an indication that you are suffering from sleep apnea. As a condition that affects nearly 22 million Americans, sleep apnea can not only make you tired and irritable throughout the day but if it’s left untreated, it can result in serious health conditions like heart failure. You know that if you don’t get a good night’s sleep, you are going to pay for it the next day, but if you’re not getting a good night’s sleep for weeks, months, or years, imagine what that’s doing to your body. Because sleep apnea causes lapses in a breath, it can wake a person up about 5 to 100 times per hour— resulting in a pretty sleepless night. So, what are some of the symptoms of sleep apnea? Let’s take a closer look. 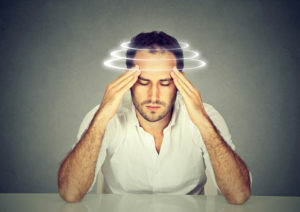 Yes, dizziness can be indicative of several underlying conditions including inner ear problems, but it is also a sign of sleep apnea. Because your body is never really getting the full rest it needs each night, the chronic sleep deprivation can cause dizziness. Yes, the loud screaming coming from your children’s mouths is enough to cause you a headache, but chronic headaches can also be caused by sleep apnea or chronic sleep deprivation. Have you ever noticed that when you are exhausted, you eat more and workout less? Another common symptom of sleep apnea is weight gain. Irritability and mood swings are another common side effect of sleep apnea. Because you are overtired and can’t get rest at night, it can make you suffer from highs and lows caused by sleep deprivation. Luckily, with both surgical and non-invasive options, Dr. David Sorenson at Blue Water Dental of St. John’s can help you sleep well every night, and get rid of all of these symptoms! To learn more or to schedule a consultation, call our Ponte Vedra Beach office at (904) 395-777.